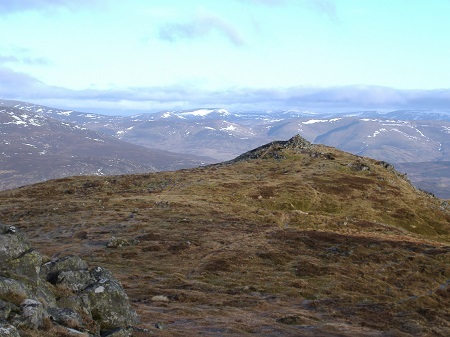 The plan had been, to write about a walk on Ben Vrackie, but in the end, we didn’t make it to Ben Vrackie or to any other hill this week for that matter. It was my birthday on Monday and it had seemed a good idea to have a nice walk to celebrate, but when the forecast spoke of very low cloud, the lazy, couch potato side of me got the better and instead of the healthy walk, we had a lie-in, a wander into town and a meal and a couple of beers instead! This was very nice and very relaxing as there aren’t many days when I don’t pick up a paint brush or spend hours doing studio related work on this computer. So then, a great day on Monday ….but as I spent the last couple of days slowly getting on with the An Teallach commission, there’s not much to tell and it now leaves me with a gap for the blog! But don’t think you’ve got off that lightly as by pure chance I came across some photos I took back in December 2005 when I’d been to Ben Vrackie with my pal Guy and another chap called Ian. An even bigger chance is that when I looked to see exactly when we’d done the walk it turned out to be 12th December …today in other words, just eight years ago. There was one great difference to today though. As I look out of the window this morning at 10.30 am, it’s almost as dark as it was three hours ago…..it’s very grey and damp and not really a day for the hills. 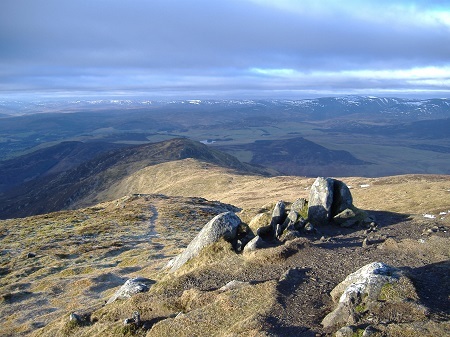 On December 12th 2005 however it was bright and sunny and cool and the three of us had a wonderful walk up Ben Vrackie and indeed, I remember the low winter sun being particularly difficult as we scrabbled our way up the steep front of the hill. Great big views from the top though and I think this was the first time I’d seen them as the previous couple of visits to the hill had been wild and grey. I remember Guy pointing out the summits of Beinn a’Ghlo to the north and thinking that perhaps one day I’d get to reach them. Anyway, the photos here were taken on that walk in 2005 and you can see why I want to go back. It isn’t a long walk although it’s a bit of a drive to get to the base of it but it makes a perfect short winter day for me. Hopefully we’ll get there again sometime in the next month or so. In the meantime enjoy the fine weather in the photos!